"Hotel is in good location, has nice swimming pool, offers go..."
Have a question for Alron Hotel? "Cool air con and great in room service meals." "Clean room, hot shower, nice swimming pool and wifi." 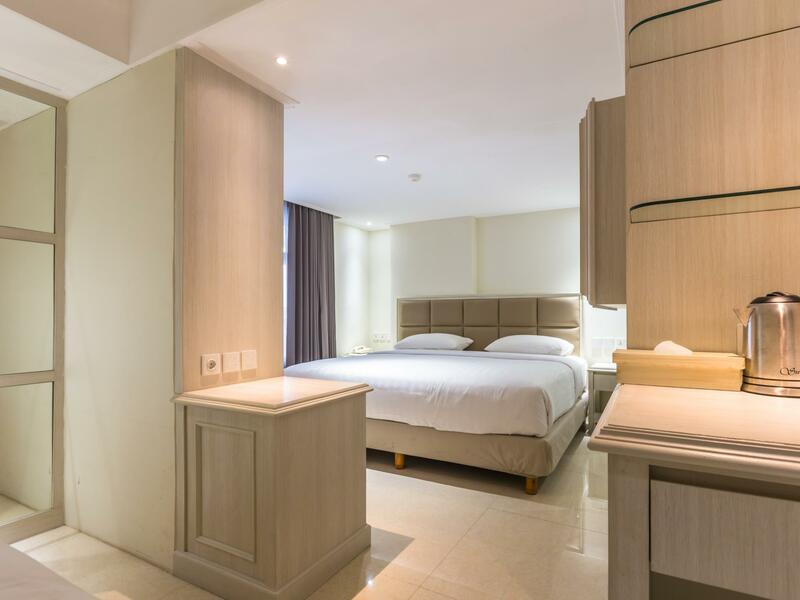 Alron Hotel is located in the lively Kuta area, and provides easy access to a variety of attractions, shopping and dining areas. It features a restaurant, a swimming pool with a pool bar and cosy rooms with views of the garden. 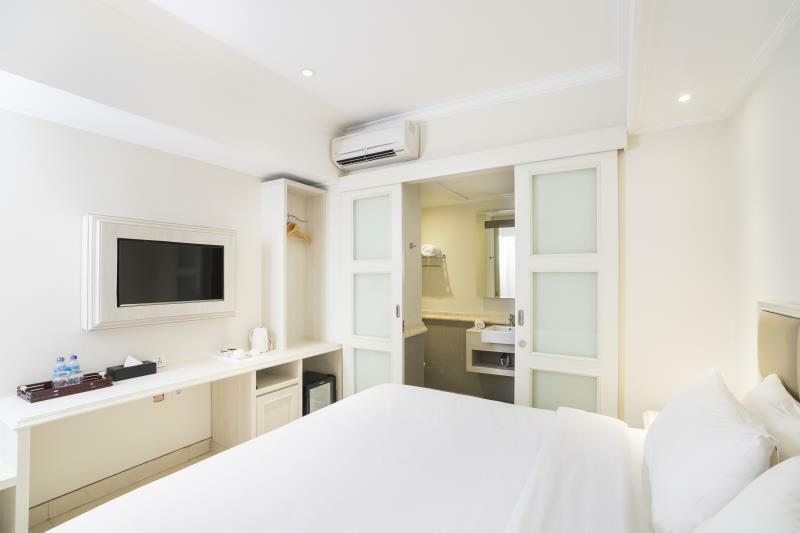 The Alron is a 15-minute drive from Kuta Beach, Waterbom and Discovery Shopping Mall. Ngurah Rai International Airport is also a 15-minute drive away. Beautiful rooms are tastefully decorated with earth colour tones, modern interiors and intimate lighting. Included in all units are a flat-screen TV, seating area as well as an en suite bathroom. De Hub Café serves a spread of local, Western and Chinese specialities. The hotel also has a meeting room and a gym. For entertainment, guests can enjoy the family karaoke and selfie-spot area. Staff at the tour desk can assist with travel and sightseeing arrangements. Luggage storage services are provided at the 24-hour reception. Guests who drive can use the basement parking area. Gym is wornout... only have 1 machine and no weights.... 2ndly... my bed sheet got some random lady period menses blood on it... 3rdly... location nothing much around there but can walk for 7 mins 4th... i dont know if its 4 star cause i there isnt any fridge in the room 5th... im not coming back here again.. should just top up abit more and get a better hotel... This should be 3 star hotel 5/10 for my stay..
Cleaniness of common areas Restful reception area with many lounge chairs. Hotel is in good location, has nice swimming pool, offers good food in the restaurant and their staffs are very friendly and helpful. Room is clean and spacious enough for its price. Our problem was the toilet area. It has poor slope drain therefore, water ponds. Good thing, they did the housekeeping as we instructed. Good location, pretty close to Kuta Beach. Staffs are friendly and accommodating. The room is small but comfortable enough. Limited amenities (No kettle and coffee/tea) in Smart Room. No toothbrushes provided as well, you need to ask so they can bring them to your room. Breakfast menu was limited but quite nice. They got swimming pool which I think is too small. I didn't get a chance to try it. Got a noise problem in one of the rooms. The next morning I requested to change room, but they only have Superior type available in the same floor. I agreed to pay IDR 50k per night to have an upgrade. The Superior room is better. Slightly larger and there was water kettle with complimentary coffee/tea. It was a small price to pay. Overall, for the price I paid I don't think I could find better hotels in Kuta area. As a place to sleep, it is really good. If you are in Bali and spend most of the time wandering out of your hotel, I really recommend Alron Hotel. Pros: 1. The rooms gets cleaned everyday and they would change the towels as well. 2. Just a straight 10 minutes walk to the beach 3. Room is comfy and bathroom is nice Cons: 1. Staff gives you no privacy at all. They talk really loudly without no consideration of the hotel guests. 2. They would knock on your door as early as 9am just to clean your room. Again, no consideration at all to the guest who may still be sleeping. Had to tell them everyday to come back later when im out. I find this really really annoying. 3. I’m pretty sure there are rats above the ceiling. Stayed there for 6 nights and almost everyday i would hear the rats squeak and run around above the ceiling. 4. This hotel may rate itself a 4 star but I am going to give it a 3 star. It only supplies basic toiletries like shower gel, soap and shampoo. No toothbrush provided. Stayed in room 105 and i would recommend you to find other hotels. Would not book again. There was a bit of confusion when we arrived in regards to our booking and our room was not ready even though it was after 2pm. One hour later it was all sorted out and we headed up to the 6th floor to our room. Room was really clean and spacious with a massive flatscreen internet enabled TV with satellite channels bolted to the wall. WIFI was spot on. And, there was none of the usual Bali ‘Eau De Mould’ smell! There was no advertised fridge in the room but after hassling them a small bar fridge appeared next day. Buffet breakfast with the usual ‘what type egg sir’ wasn’t too bad and enough to get you through to lunch. Staff were really friendly and room was serviced every day complete with complimentary waters. Location is right at the end of Bukung Sari Road which merges into Jl Kalianget and then on corner of Jl. Blambangan. Very, very busy road to cross. When security is on duty they will stop traffic for you to cross, when they ain’t around you take your chances. The tip is though, when you come out of reception, walk to left, cross first intersection and you will see a pedestrian crossing (which everyone will ignore). Because 90% of the traffic turns right at that intersection, keep an eye out to right (road is one way only) and you can cross pretty easy and head to the beach/Kuta Square which is a 10/15 minute stroll past yummy warungs, massage salons, shops, etc. And if you keep going past that pedestrian crossing to the next intersection you have a huge Hardy’s shopping complex and supermarket. I would recommend and we will stay there next time we visit Bali. It has mini swim pool, clean room, quite space bed room, cozy bed. We stay exclude breakfast, but near hotel there are food courts. No worry. Near to convenience store like Indomaret and Alfamart. 15 mins walk to Joger store. Friendliness of staff depends. A couple of time when we tried asking about the whereabout, we had the sense that they are so unwilling to help up. When we asked how much will it normally cost from point a to b, they would always say you have to check with the driver. And in fact, when we get the hotel staff to order a cab for us from the hotel to the Tugu Station (train station), which normally cost at most 30k, the driver charged us for 50k. Not sure if the staff from the hotel earned any commission from this. Aside from this, the location is good and the rooms are clean. Right in the heart of Kuta. Nothing to complain about with friendly staffs. Missed my breakfast by 15min which they didn't accommodate. Staffs should have considered i checked in late at night. Still would be happy to go back. the best rate for the modern room that i had, they cleaned my room everyday, the location is great you can easily roam around the places at night, Jimbaran beach is just minutes away though Pandawan Beach and Dreamland Beach is quite far..all staff are extra friendly especially Monica in the reception she smiles all the way to the guests. this is a nice place to stay if you need to go to the airport or are arriving from the airport. the taxi fare if you grab a cab on the street is 30,000IDR -40,000IDR the staff is friendly and they allowed us to have a late check out since our flight was later in the day. beds are comfy and the breakfast is buffet style so you can grab what you want. overall rating I will give is only a 7 because of these 3 issues: 1.) they should improve their lighting system. spooky and dark hallways especially at night time 2.) I do not get the logic of providing you with sachets of tea and coffee yet there is no electric kettle provided in the room, you have to go down at the resto area to ask for hot water + I complained about the unusable mini ref (2 days had gone and my bottled water and other drinks placed inside remained not chilled). A replacement was provided---still another broken thing. tssk, tssk. 3.) wifi is terribly slow and fluctuates more often ion the 3rd floor + so annoying too is the fact that they made it compulsory for you to advertise the hotel by logging on to your social media acct first if you want to avail of their connection. What about privacy issues??? And what if you don't have social media accts or even if you have, you just wanted to read the news? 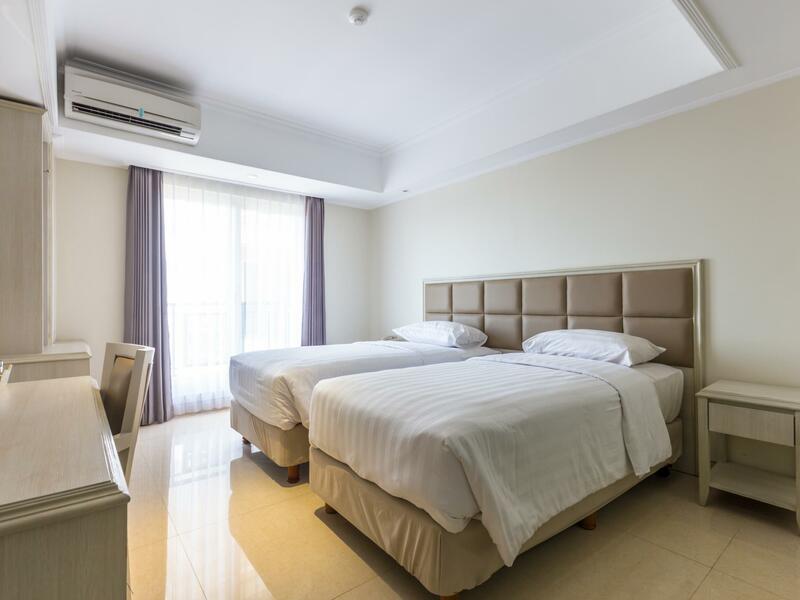 budget hotel with limited facilities e.g. no pool, free shuttle for customer but is worth for the money paid for the room. room design is modern but no much entertainment at surrounding area. need to walk around 10 minutes to dining & shopping area. it can be quite torturing walk under the sun of 35 degrees for 10minutes! get ready with sunblock for ladies. 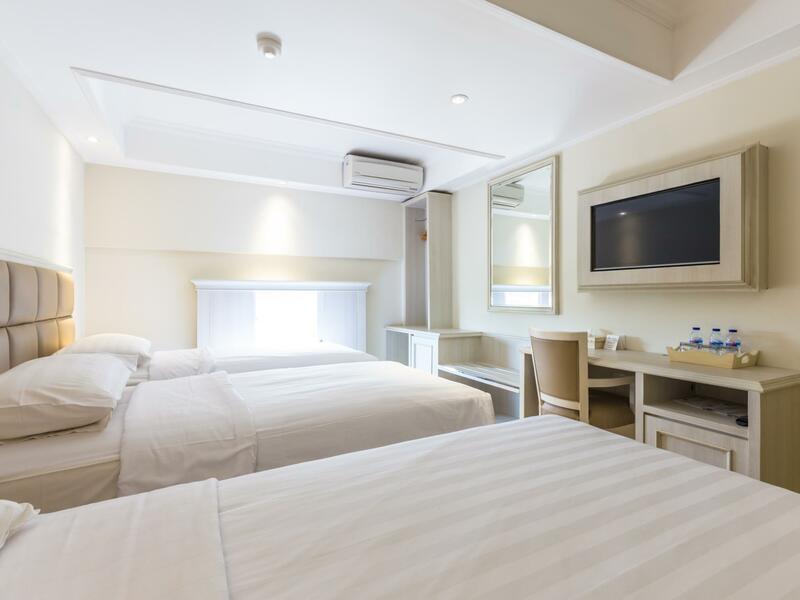 overall, a good value for money hotel with basic facilities. Room very clean and comfortable, beside hotel was a food center that selling a cheap food and drink. Staff there very polite, efficient and attentive. Just the location a bit far to Kuta beach, breakfast not so nice, but still worth it to stayed. My stay at this hotel was great. Fast check in and simple room with sufficient amenities. The location is convenient with many stores nearby. The hotel is able to get you a taxi within minutes. The room service spread was delicious. The hotel allows late check out at a small reasonable fee. I will definitely return to this hotel for its great service at good value.